This post was provoked by a discussion with a UK-based professor (let’s call her Rebecca Smith, not her real name) who mentioned on twitter that she had received an inquiry about a PhD application by email from someone addressing her as “Hey Rebecca!” Was this a faux-pas on the applicant’s part? You may think it stuffy, but many people still feel that in more formal situations first names should be reserved for people who already know one another, however slightly. Talking about this may seem rather uptight, but it is important practical information. Whatever the rights and wrongs of it, if you don’t know how to write a formal email, you may be missing out on real opportunities as a result. Academics are not, on the whole, especially keen on hierarchy, status and titles. In everyday life, they do not stand on ceremony and refer to one another as Professor This and Doctor That. But this does not mean that anything goes. We all know that there are some situations in life when a little more formality is required; applying for a job or PhD is certainly one of those times. Most academics feel that when initially making contact, first names are not appropriate, but applicants may not know this, or realise the impression they create when they do use overfamiliar language. After some discussion on Twitter, I decided to create a survey to get the facts. We had over 200 responses, mainly from UK and US based PhD qualified academics. The results summarised here are from the first 191 responses. These relate to a situation where someone is writing about a possible PhD, but we get similar results for academics contacting one another about e.g., an invitation to speak at a conference – something I’ve done quite a lot. The same rules apply in all formal situations and beyond academia it is a good idea to use people’s titles and avoid informal first name greetings when you are making first contact with someone you don’t yet know. When contacting an academic you don’t know about a professional matter (e.g., a PhD or job opportunity), one thing you should not do is use first names. As you can see, these are considered highly inappropriate by most of our respondents. We asked respondents, to rate various possible email openings on a scale of 1 (highly inappropriate) to 5 (ideal). The graph shows the ratings for the least popular email openings, collapsing across all PhD-qualified respondents. A small minority of academics are untroubled about this, but most of our respondents expressed some concerns. The main worry is that the person who wrote the email is not giving much thought to the way they might be perceived. Perhaps they are not taking the situation very seriously, or perhaps they have more general issues about the way they present themselves. These might lead to problems in the academic environment – for example, some of my colleagues in Psychology work with children, parents, vulnerable groups and patients; they want to feel sure that any member of their team presents themselves as a professional and gives due respect to other people’s sensitivities and boundaries. They may be concerned that a particularly careless applicant might cause friction with other team members or with colleagues, collaborators and rivals. We asked respondents whether how they would feel about receiving an email with an overfamiliar opening. Click to see full size. So how should you begin an email when you are inquiring about a job, or PhD position? Is it “Hi Rebecca”, “Hey Rebecca!”, “Hi Dr Smith”, “Dear Dr Smith”, “Dear Professor Smith”? Respondents rated the appropriateness of emails beginning Dear Dr (1=highly inappropriate, 5=ideal). Broken down by category of PhD qualified academic respondents. UK professors prefer the title “Professor”, but most other respondents rate “Dear Dr ” as ideal. Respondents rated the appropriateness of emails beginning “Dear Professor ” (1=highly inappropriate, 5=ideal). 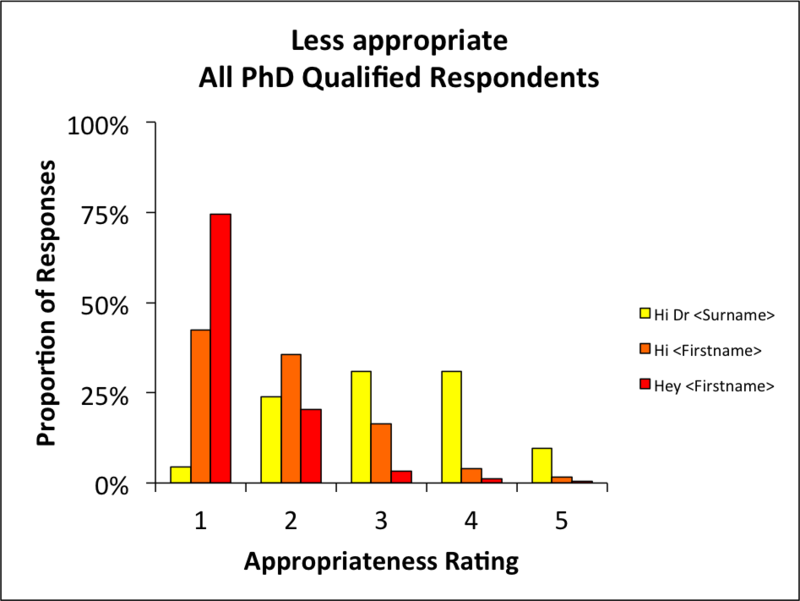 Broken down by category of PhD qualified academic respondents. 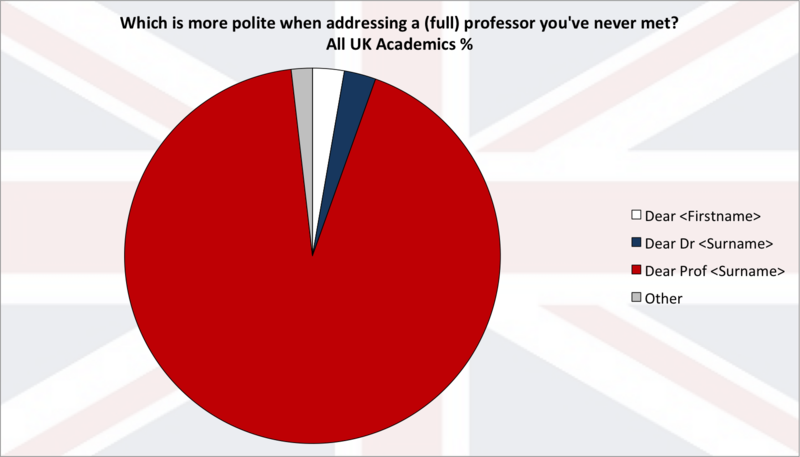 UK Professors respondents rate “Dear Professor ” as ideal, but others do not find it hugely inappropriate. In the UK, you should check the recipient’s correct title (normally on their web page) and use that. UK academics will generally have PhDs, but very senior academics (not necessarily old) may have been promoted to Professor. If someone is a Professor they will generally prefer it if you recognise this and use the correct title: “Dear Professor Smith”. If someone has a PhD and is not yet a professor they will generally prefer it if you use “Dear Dr Smith”. Neither will be gravely offended if you get the wrong title, but it may seem a bit careless. 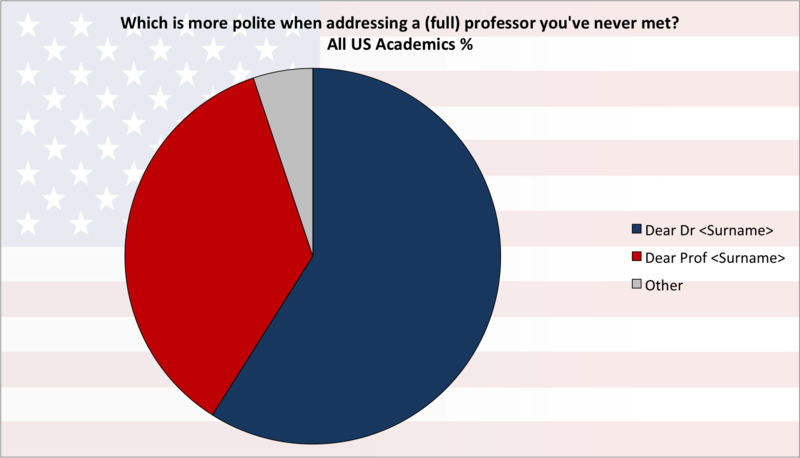 In the USA, the title Professor is used differently, often in a teaching context (e.g., in class, or in emails between students and their teachers) and is not reserved for senior academics with PhDs etc. 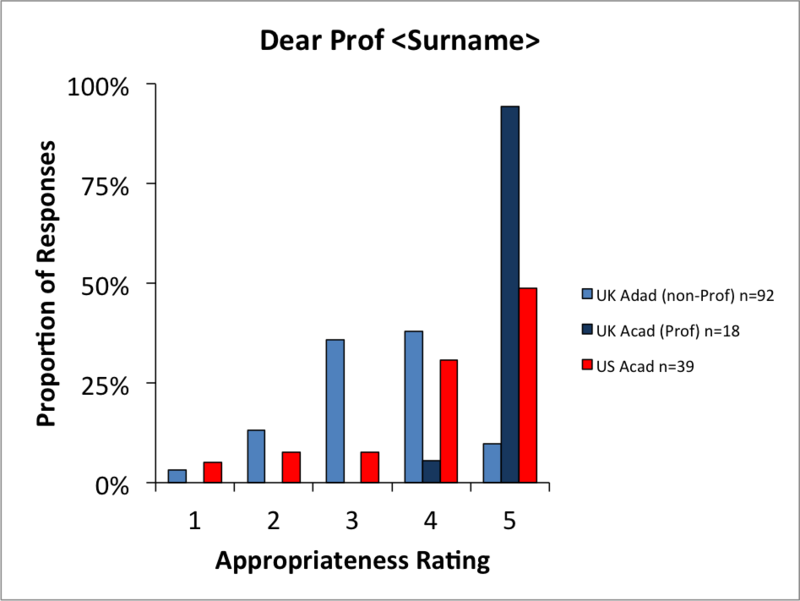 The majority of our US/academic respondents felt that “Dear Dr <surname>” was the most appropriate way to address a full professor – recognising their academic qualification. 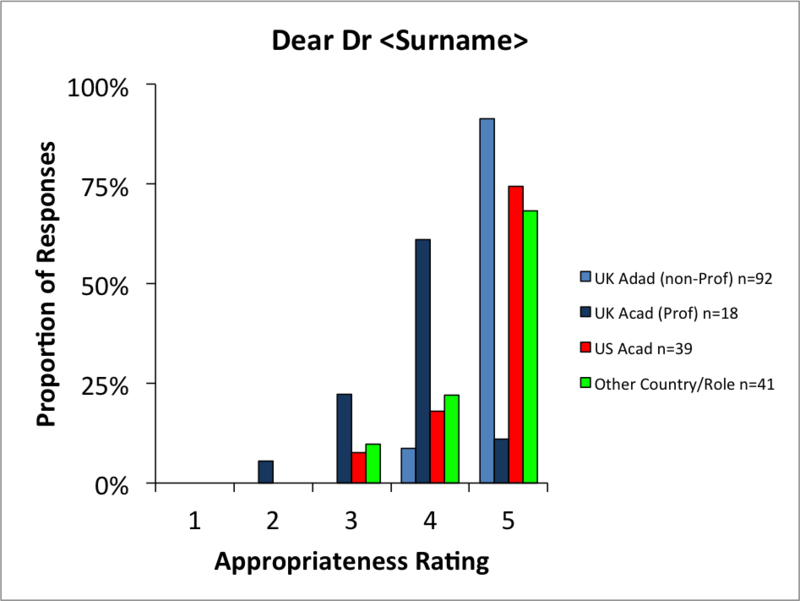 Some responses implied that “Dr” is seen as a higher status title (contrasting with the UK position), but there was less consensus about this and the titles appear more interchangeable in the US. American academics were split over the most polite title to use when addressing a (full) professor who you’ve never met. The majority favour “Dr” and some responses implied that it is seen as a higher status title in the US where “Professor” is applicable to a wide range of University teaching staff including, at some institutions, people without PhDs. The title seems to be more interchangeable in the US, but appears to be more strongly linked with teacher-student communications as distinct from research context. “I am German. In Germany, the doctor title officially becomes part of your surname and can be entered in your national ID. Most people do not use it for themselves or to adress others in everyday language except for physicians (Herr Doktor or Frau Doktor – sometimes even without the surname – similar to the use in English). Usually you don’t introduce yourself using titles, except they appear important in the situation to clarify your function. However, usually you are expected to be humble about it. Bear in mind that many academics, wherever they work, will be used to the English language conventions of major international journals. Nature Editor Noah Gray advised me that his system defaults to “Dr” if authors do not express a preference. 1. If you are approaching an academic about a job or PhD position and you don’t already know them, don’t use his or her first name in your first letter or email. 2. In the UK, look up the academic’s correct title and begin your email “Dear Dr <Surname>” or “Dear Professor <Surname>” as appropriate. In the US, “Dear Dr <Surname>” is probably most appropriate, but the titles are more interchangeable, and there is less consensus about their use. 4. In many cases after the initial contact, the person you’re contacting will reply with their first name e.g., “Best wishes, Rebecca”, and this can be taken as an indication that it is OK to use first names from then on. This is my own rule of thumb for more formal correspondence, and many other academics have told me they have the same policy. Thanks to Taliah Farnsworth (Visiting Undergraduate from University of Denver, working in my lab) and Becky Gilbert (PhD student from Minnesota working with Graham Hitch and I), for help in contacting American respondents, analyzing survey data and for interesting discussions about the American perspective. The survey is still open. Here is a pdf version. Respondents further comments in full (pdf). This seems obvious to me. I know that I’m happy to be addressed as Mike, but someone contacting me for the first time doesn’t know that. So play it safe and address me as Dr. Taylor in your first contact. Then after I reply signing myself just “Mike”, you can switch to that for subsequent messages. I agree these things are pretty obvious if one has spent time in academia. There was a high degree of agreement among our respondents. I am not sure that it is so obvious to young people who are entering academia, especially when they are moving to a different culture. That said, I think people are given a lot of latitude about these subtleties if they are coming from a non-English speaking background. What may be problematic is moving between English-speaking cultures where expectations may vary. It was hard to understand for example how Americans understood the title “Professor” and I had the sense that American respondents also thought the questions a bit weird. I think this relates to the way Americans use titles differently to the British. We refer to our Prime Minister as “Mr Cameron”, whereas this would not happen in the US (he’d be known as “Prime Minister Cameron”). So there is the widespread use of job titles in formal address, which we just don’t have. Talking to visiting US student Taliah Farnsworth, I think she said that even a traffic warden might be addressed with some kind of official title. Two cultures divided by a common language! The (admittedly limited) usage I’ve observed in the United States is that one calls one’s own teacher “professor” regardless of rank. I can’t imagine calling someone who hadn’t taught me “Professor Lastname”, whatever their position. I think some research is in order. I once had a TA called the class professor “Dr” when clearly the prof’s bio’s indicated that he didn’t have a PhD. Yes…there was a time when you didn’t have to have a PhD to become a professor at a less than PhD granting university. Exactly. The current etiquette appears to be that on first contact by email you both address each other formally as matter of simple courtesy, and then revert to first-name terms. I think this is in analogy with how it would work face-to-face, but more and more we have contacts which are primarily by email. So, how are the stats in reality? How many letters do professors receive with each possibility of how to be adressed? I’m not sure what the stats are. Many of our respondents had received informal emails as their detailed responses (see pdf link above) make clear. Even if it is fairly rare, for the person sending out “Hey Rebecca!” style emails, the effect on their opportunities is likely to be big and negative. I remember when I was growing up (this is in Britain, of course) there were still strict rules about “how to behave if you want to get along” and I guess there probably still are. They always seemed crazy to me, and thankfully our society is much more fluid and flexible now, so people can behave more naturally in a much wider range of situations now. I am sure that 20 years earlier my “mockney” accent would have held me back much more than it does now. But even today some situations are much more formal than others. By treating e.g., a job application as a very informal/relaxed situation, applicants are signalling that they doesn’t feel it is serious, that perhaps they are overconfident or arrogant, that they may not have thought about how they are coming across, that they may not care what other people think. These are not items that you would typically want to add to a carefully constructed CV. So why put them at the very top of your very first communication? I confess I’m relatively relaxed about how people address me, having worked both in a very formal system (Germany) and a very informal system (various Scandinavian countries) and now working in the UK. The Norwegians have a saying ‘a beloved child has many names’, so I say let diversity rule! But funnily enough, what does really irritate me, though I’m not sure why, is getting an email from a fellow academic (not a student or applicant) who doesn’t know me personally and so writes ‘Dear , if I may,’ I mind less how they address me than I do that creepy ‘if I may’. It’s one of those things it’s impossible to reply to…. That was supposed to read ‘Dear Firstname, if I may’ – sorry. Very good post, I’ll make sure to share that with my students. It also told me that I should reconsider how I sign off on my mails, since in correspondence with students I usually use my full name, but no title. I should probably either include the Dr. or stick to the first name. Yes, this is a good point. I have an automatic signature which has my title, address etc. When this post was discussed on Twitter some colleagues pointed out that I answer some of my quicker emails with my initial. I think this is OK once you know someone well, but perhaps it can come across as a bit dismissive/casual? I think it can be a problem if academics switch too quickly from formal to very informal (signing off with initials or no signature) as it can leave students unsure as to how to respond. So academics also need to take care to observe these niceties in the first exchanges. Some also pointed out that academics do not consistently use titles when contacting students, which might be an issue. I find teaching quite “initimate” so I definitely feel on first name terms once I’ve spent time with a class. I don’t think it gives offence. Similarly for existing students I haven’t actually taught most contact me with informal styles – which is fine because for teaching matters these emails are not normally formal (some others might not agree). I normally respond in kind. In fact friendly and informal atmosphere is one of the nice things about working in a University, so where the situation doesn’t demand it, it’s nice to use more informal language. When I was managing the admissions to one course, I tried to respond to queries in a formal way using e.g., Dr/Mr/Ms where appropriate. I am not sure I always stuck to this; some applicants’ queries were pretty informal, others very formal (applying to a course is a pretty formal situation, so I’d recommend the “Dear Dr/Prof” approach). I think the important thing is that for initial contact people on both sides always consider the formality (or otherwise) of the situation. If you are uncertain, and you are asking the recipient to do something for you that they don’t have to do (such as give you a job), then I would err on the side of formality for all the reasons spelled out in the post. If you need any more convincing, read through the detailed comments our respondents sent in at the end of the survey (pdf link above) – it should convince you. Thank you for taking the time to survey and write the results. I feel like a walking anachronism when I address someone in the more traditional way. Writing “Hi ” feels overly familiar unless I know the person well. To me, writing is a formal act whether in an email or via the use of my favorite fountain pen. Thank you very much for discussing this topic. I am originally from Germany, which still uses a very formal system, in and outside of academia. When I started my undergraduate degree in the UK five years ago, I naturally referred to all lecturers and professors with the appropriate title. Conversations would go like this “Excuse me, Professor soandso, can I just ask a quick question on …?”, or “Thank you very much, Dr soandso for your time, I really appreciate it”. This would certainly be the one and only way to speak to a lecturer/professor in Germany (don’t even think of saying their first name, ever!!). I soon realised that I frequently got the looks by my classmates, and by the lecturers. The trouble was that by this time I felt ‘stuck’ with the titles. Could I suddenly refer to Professor X as ‘John’ just because I had spoken to them a few times? I never did, and the same was true for e-mail conversations. According to Mike Taylor’s post above however, it is appropriate to switch to a person’s first name, so this has been very useful. Still to this day, I feel unsure of what to do, so in first e-mail conversations I would always play safe and use titles. Strangely, in face-to-face conversations, I settled on a rather subjective ‘gut feeling’ that seems to be guided by the age of the person: any Dr/Prof looking above 45-50 years old will be addressed with their title; anyone looking younger is more likely to be called by their first name. I guess this could be perceived as negative by some people. Any suggestions? I think the above rules (1-4) will work well for you in emails for the UK at least. Face-to-face situations are normally much less formal (except for interviews, etc.) I can’t think of many who would expect to be addressed by a title, but there may be one or two. However, you’ll rarely cause any serious concerns by being *too* formal in the first meeting, if you feel more comfortable with that. It’s being too informal/familiar that tends to be problematic. BTW I’d avoid making too much of a distinction between younger/older colleagues. Not many are prickly about the use of titles, but people who’ve only recently gained a distinction (whether Dr, Prof) can be more sensitive. A new postdoc, or recently promoted Prof will likely appreciate your courtesy as much or more than a wizened old timer. I always found that its because one often develops a very intimate and personal relationship with students who one mentors in the laboratory its valuable to retain being addressed by title and surname to remind them that it is a working relationship with a formal basis as well as the aspects of day-to-day friendship. This changes, when students actually join the lab I work in and things become 1-on-1 and projects need to be planned and coordinated, together. Then it is necessary to relax the relationship a little. However, I am in the US now, so I would of course adjust… but I don’t teach undergraduates anyways because I am not at a college or university. This is incredibly helpful for those of us from non-academic backgrounds who are corresponding with or collaborating with academics. Coming from the formal, hierarchical society of the U.S. South, one of the hardest things for me to get used to about the culture of the software industry was the insistence on first names for everyone. I still recall being laughed at on my first day at work when I referred to the C.E.O. as “Mr. Lastname.” In the fifteen years since then, I’ve never seen an exception — even when 50% of the male employes share one of the same three first names, causing persistent confusion about which “Dave”, “Jason” or “Chris” someone’s referring to. First names are professionalism in my world, whether I like it or not. It’s interesting that almost every respondent starts out with “Well I don’t reaaally care about how I’m referred to, BUT it DOES concern me that…” Why not just go ahead and admit that they care how they’re referred to? Is it a strong social norm against appearing to think too much of oneself? The other thing I find interesting is that there seems to be absolutely no mention of what the rest of the email contains. You’ve taken the time to open the email, but you’ll actually stop RIGHT after reading the first line? I’d find it a lot more interesting if your survey considered impressions of the relationship between the greeting and the quality of the rest of the email instead of between the greeting and some imagined summary of the person behind the email. Do “heya” greetings tend to correspond with sloppy/uninteresting/inconsiderate messages? Or is there no pattern? If an email starts with “Hi (first-name)” – but then proceeds to be a well thought-out and engaging note, do you drop it anyway, or did you just never read the rest of the note because of the greeting? The greeting certainly seems like a piece of data you’d want to look at, but isn’t the rest of the note even more interesting data?? How about “Don’t call anyone Doctor unless he can write you a prescription for ampicillin”. That seems to work nicely for me. Thank you for a wonderful breakdown of proper etiquette. Unfortunately, I have a conundrum regarding an atypical scenario. I need to address a PhD and a non-PhD who, jointly, teach a course in one correspondence; and this is a university in the US. I always prefer to employ proper titles and give credit where due. However, I do not wish to offend nor inadvertently diminish the accomplishments of one by referring to the other as Doctor and that person as Professor; nor do I wish to fail in acknowledging the PhD as Doctor. Any advice on how best to proceed is greatly appreciated, thank you. Do you know them, or is this the first time you’re contacting them? I am not expert, but I would try to use first names when addressing a group where I know some of the recipients in real life. Otherwise it seems to exclude the other parties from a more cosy social group. This is the sort of thing that can happen when setting up new collaborations (teaching, research) with colleagues you expect to work closely with in future. In the UK my feeling is that knowing one member of the group gives you an “in” and you can maybe use first names with the others too. I would not do this in a formal job applications etc. however. If I don’t know either of them in real life, I might be inclined to feign ignorance and address both as Dr. I think it’s safest to err on the side of caution with titles. That’s an urban legend, a very persistent one though. No degree, doctor included, ever becomes “part of your surname” in Germany. Interesting discussion. I would say that, in any communication, unless the recipient is someone I know, or a relative, or much younger than I am, I would use Mr. or Ms. Surname to address a stranger. I would generally (unless it is in very formal circumstances) sign with my given name, which would be an invitation for the recipient to use it in reply. One exception, based on my limited observation (at UNC Chapel Hill): if the campus includes a medical school, the the academics with PhDs often like the “Dr.” because it puts them on a more equal footing with their physician colleagues. Although I have a PhD (in a field other than what my career has been), I never use “Dr,” and I see it used only in my alumni-fund solicitations I’m not a physician, so I don’t see any point in giving myself airs or insisting on too much formality. “…After I [moved to the West Coast], I committed a string of social gaffes in which I failed to address or introduce some Ph.D.-endowed person with the correct title. We simply never did this where I grew up because it would have given us the faintly comical affect of characters in _The Crucible_ addressing one another as ‘Goodman this’ and ‘Goodwife that” (in our town there was one man, not employed in academia, who had a Ph.D., and who insisted on being addressed by his title. The view taken of him by everyone else might most politely be described as bemused). I was born, raised and educated in the states and the simple norm in the US that I grew up accustomed to was “when in doubt, call him/her Professors X. If he or she has a PhD, call them Dr. X”. That’s it. The one thing not mentioned here is that in developed economies one respects the oracles of knowledge by keeping a safe distance. This distance is there not to say that one person is less than the other, but to maintain the impartiality when the professor expands your knowledge frontier and evaluates you in that pursuit. And what a beautiful thing that is. I teach at an international university in LATAM. Sadly, I must say, students here call you by first name. That is horrendous. In fact, there is no distinction between a Professor that teaches you tennis sport basics and the one that teaches you think critically and for yourself. All of us who understand this are simply trying to create a safe distance between the pupils, ensuring our evaluations are not biased by personal exchanges. It would be great if more of our students understood that. Further, I only wish more of them understood that outside of the university I don’t like to be called Professor. Is really in the classroom or within the University context. I could care less what you called me outside of that ecosystem .